This is Jill, Nick, and Bentley. We love this dog. He has been a part of so many photo session we have done with this couple. We knew he was going to be a huge part of the wedding day. 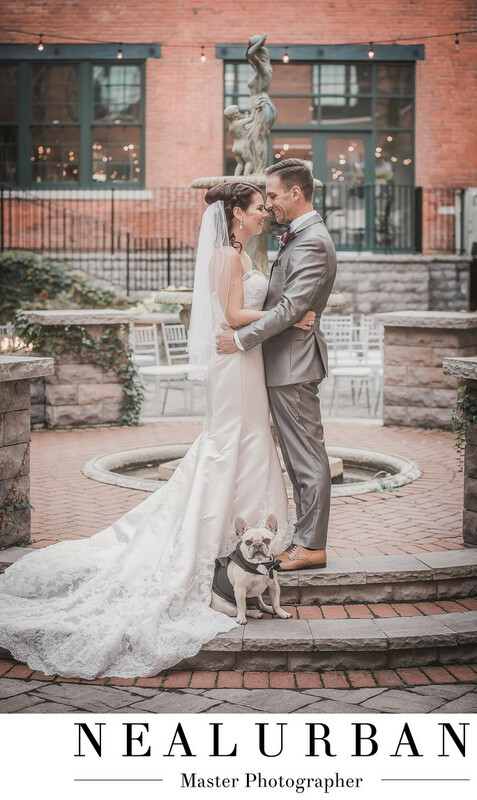 Nick and Jill had their ceremony and reception at the Foundry Suites in Buffalo. It is a really great venue. They also got ready there. Neal got some amazing images with Nick helping Bentley get into his little tux! They were so cute! This was after the ceremony they had in the courtyard. They wanted to include the Frenchie in the photos. He is a part of the family. This image was kind of neat too. There was a family photo of Nick's parents just like this with their dog. The groom asked if we could do something similar. We said let's do it where the ceremony took place. We never have any problems getting Bentley's attention. He loves the camera. We had the bride and groom get nice and close and look at each other. We told them not to worry about the dog either. Just stay locked in at one another. Then we called Bentley to get his attention. This turned out so cute! The newlyweds loved this image. So much that it was selected for the cover of their wedding album! Location: 1738 Elmwood Ave, Buffalo, NY 14207.